A few years ago I told myself that I would get serious about exercise after my 3rd (and final) baby. Until then...meh. Do whatever. For kind of a while. It took a looming swimsuit vacation to finally kick me into action. The Caboose was over 18 months old when Aaron's brother got engaged and we were suddenly looking at a fall trip to Hawaii for his wedding to a tiny, adorable Frenchwoman. I got a gym membership in June and worked hard until our trip in October. There are certainly fitter people out there but I dropped some belly fat and got more toned and I felt comfortable in my swimsuits. It wasn't until I got home that I changed up my routine and started seeing more solid results. If you've seen me in person in the past few months I've probably flexed for you or maybe shown you my calves. But I have baby muscles! I'm still figuring everything out (and my thyroid is complicating things and making it difficult to build muscle) but, judging by the questions on my Instagram stories, I'm not the only one who finds getting in shape confusing and a bit complicated. So today is the first in a short series of posts breaking down everything I've done that's gotten me to the gym regularly for the past 9ish months. I actually wrote a lot of this stuff down back in January but I made myself hold off on posting. I'm a big fan of setting goals for the new year but I don't think January 1 is a great time to start a new fitness plan. People seem to roll into January ready to go hard and then they burn out. 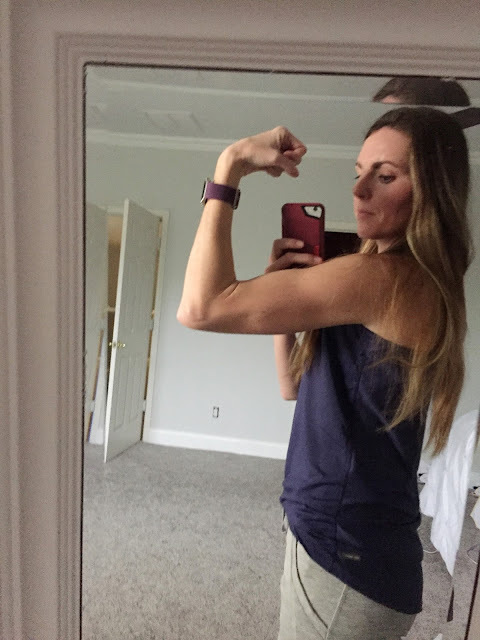 I first ventured into the gym on a Wednesday afternoon in late May and it took me a while to build up the momentum and habits that I have now. I'm posting mid-week in February so the information is there but it's not tied to any artificial start date. If you're not that active but want to be, start slow when you feel ready, not when the calendar tells you to. When I first started going to the gym I, with the help of Google, cobbled together an arm day for Monday and a leg day for Wednesday with a vague idea that I should maybe do some kind of full body workout on Friday. Three days at the gym seemed good, right? Three sets of ten reps for each exercise? Sure. I'd do my Monday and Wednesday workouts but then Friday always ended up being sort of short and useless (if I even went) because I didn't know what to do when I got to the gym. I settled for doing Zumba once a week. For cardio? Yeah. After a few months I hit a plateau. My patchwork routine was a great starter situation for me but it had gotten me as far as it could. When we got home from Hawaii I decided I was ready for something a little harder to keep me interested and motivated. Several people recommended bodybuilding.com but it was Elaine's recommendation (and, let's be honest, her booty) that finally pushed me to do it. She recommended a couple programs and I decided to start Jim Stoppani's Shortcut to Size. She swore I would build muscle but I wouldn't get huge and that has definitely been the case. I recently (as in, yesterday) moved on to an Erin Stern program. You can also use the find a plan tool to find suggestions that work for your age, size, and goals. Four days a week I print off my workout and take it to the gym with me. I know exactly what I need to do and how many reps. There's a printable log to keep track of how much weight I lift (there's probably an app too but I have a 16gb iPhone and there's no room for anything beyond music, Google Maps and Instagram). I don't have to wander around the gym wondering if I should be using this machine or that free weight. The planning has been done for me by someone who knows what they're talking about. It's really hard to come up with a solid fitness plan on the fly. Plan your workout ahead of time. Watch instructional videos so you know proper form and how to avoid injury. When it's time to lace up your shoes, you'll be ready to work! This could be perfect timing. My caboose just turned a year and I stopped nursing (my body is weird when I'm nursing). Thanks for sharing! Looking forward to your posts. My body is weird when I'm nursing too! And any exercise tanked my supply so I had to put it off until we weaned. Nursing, man. It messed with you. It really does help! My back bothers me a lot less now that my back muscles are stronger. That picture of you and your kids in Hawaii is gorgeous. (And I'm not saying that in a leering way). Hawaii is gorgeous and it's hard to get get a bad picture there! Why thank you! I LOVE the picture. It was such a fun day. I.....I need this. I need this plan. I am finally to a good place with my cardio, but am afraid of all the machines at the gym. Although, they just got a rowing machine, and that looks pretty intriguing. Because I'm a prep-school chick who rows now!? In the middle of the desert?! I don't even know. My gym doesn't have a rowing machine but I use one of those convertible weight machines and do rows and it's my favorite! It works a whole bunch of muscles and feels so good.